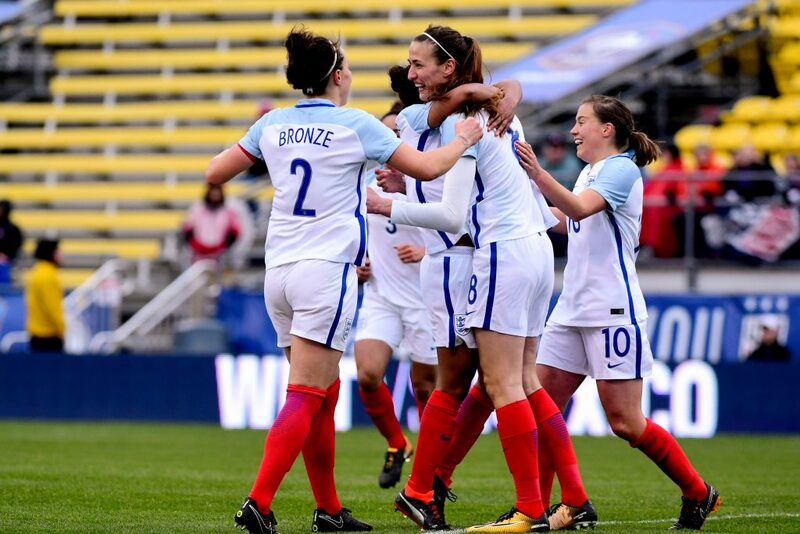 Despite the grim conditions there was an unsurprising feel-good factor surrounding the England camp (save for concerns over Anita Asante’s possible knee injury) following their convincingly sharp, 4-1 win over France. 43 years without a win against our cross-channel neighbours and then two victories in the space of eight months! It almost felt like this is the new normal – in a good way. And France were made to look flimsy – in a bad way – which was perplexing, even if they are ‘in transition’. 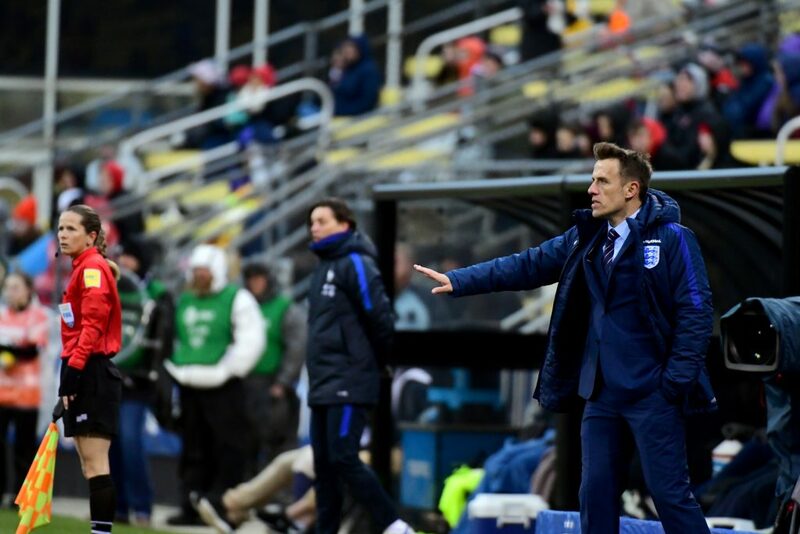 The Lionesses’ new head coach had presided over England’s biggest ever win over the French, in his first game at the helm and was a happy man. They delivered a style of play that I enjoyed watching. As manager, you’re never at that moment where you’re enjoying the game because you’re thinking about ‘what if’ scenarios and positions of players but there was a period of 10 or 12 minutes where I was actually sat back and just enjoyed watching the type of football that we’d been practising. They took everything in that I wanted them to, for 38 minutes, and they did well. I definitely want more and I told them at half time. For 38 minutes they played well but for the last 7 minutes of the first half I wasn’t pleased with them at all, they were all over the place. They were 3-0 up against France, which they’d never been before, they were probably celebrating thinking ‘we’ve made it’ and then we could have conceded a a goal because we lost our shape, lost our discipline and we lost the things that we’d been good at for the previous 38 minutes. We addressed that at half time and they came out after half time and got the fourth goal! It’s always difficult at 4 or 5-0 to keep the rhythm of the game when you’re making four, five, six changes but there were still chances. Ellen [White] had a couple of chances where she could have slipped Jodie [Taylor] in. France got a goal at the end, which the players aren’t happy about (which is pleasing) but it was a convincing performance. I’ll be honest with you, I expected it [the great start]. I didn’t expect a tight game. I spoke to Lucy Bronze on the training ground the other day (she plays with and against many of these players) and said after I say my piece bef0re the game I want you to stand up and tell the players what your thoughts are, about what you think we can do today. She plays with [Eugenie] Le Sommer and [Amandine] Henry, these really good and established players, that our players think are on a different level and she said, ‘We can thrash these today if we play to our potential.’ And we did that. So I think there’s an inner belief that this result can give us. They might not have thought they could do it before the game but they went out and showed that they can, which is the most important thing. It’s just the start and there are two bigger tests to come, against the number one and two in the world. The challenge now is to win the next game against Germany and playing that type of football. And that’s more important to me than the result really, I want us to play that style of football, against the best teams in the world. France aren’t the best team in the world but I think we’ve taken a major step forward today. And when you’re a new manager and trying to instil new beliefs, it’s important that you get a good result because it reinforces that what we’re doing is right here and there was an enjoyment, laughter and an excitement. I was a little bit nervous before the game, I had a few butterflies, but my players didn’t. That’s the most important thing. There is great expectation and I love that expectation. On the bus, on the way to the ground, it felt right. It felt right standing in the technical area. The players are enjoying the raised expectations and the higher profile. They worked their socks off and seeing their smiles at the end – they’ve got a happy manager. Anita Asante is going to be assessed in the morning. Hopefully it’s just a knock but I knew when she went down we needed to get a replacement on. It’s a position [centre back] where we’re struggling in numbers at the moment but Abbie [McManus] came on and was fantastic. If we’re talking about players that have impressed me in the WSL, that have probably come form nowhere, then Abbie is one of them. I’m looking for different things than other people have been looking for. I’m looking for someone to take the ball from the back, play with composure, obviously be a good defender but she’s got all of those qualities and she showed them. So I’ve got no qualms about playing her again on Sunday against Germany.